We design, make and supply a wide range of refill paper, which are widely used for commercial as well as official purposes. These refill paper are made from superior quality raw material and are available in multiple number of sizes. 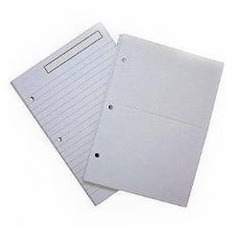 - Size: 10 1/2" x 8"
We are a most trusted name among the topmost companies in this business, involved in offering Ruled Refill Pad to our esteemed customers. 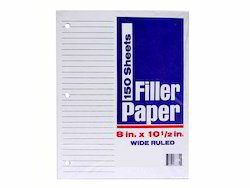 This Ruled Refill Pad is tested on numerous quality stages before final dispatch. Hard Bound Books, Exercise Books, Children Books, Board Books, Composition Books, journals, Charts, Catalogs, Posters, Calendars, Brochures, Fun & Activity Books & Gimmicky Paper Products like Pop-Up Cards & Books. We specialize to offer superior quality of refills pads, which are used in refilling all the important official details. These refill pads are perfectly bound with cloth tape so that they can remain together without getting detached. These are useful for the executives, marketing personals, school and college students etc. They can make notes of their important meeting and other working notes and take out the sheets from the refill pads directly to file the paper. We offer Filler / Refill Pads to our customer.